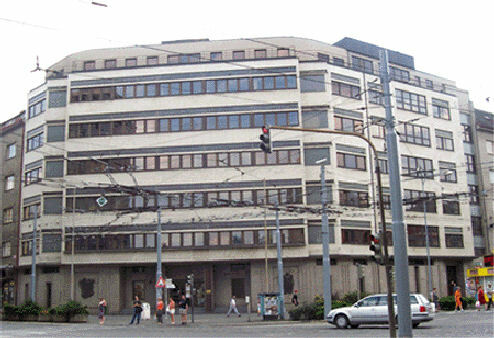 The building which stands on the corner of AmerickÃ¡ tÅ™Ã­da and Prokopova ulice was previously the communist party’s regional headquarters. Currently it houses the University of West Bohemia’s law faculty. 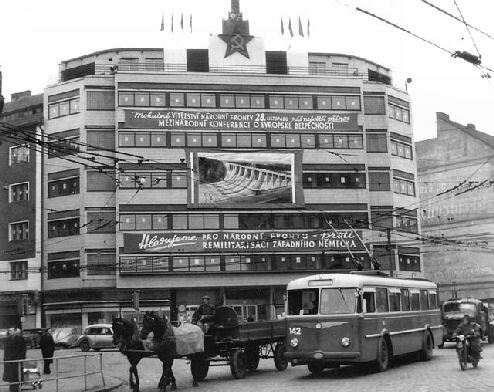 The above photograph shows how the building was extended on the AmerickÃ¡ side to fill the gap seen on the earlier 1950s photograph. There are now plans to extend the Chamber Theatre (KomornÃ­ divadlo) into this building. The building was built as “Hasicska vzÃ¡jemnÃ¡ pojiÅ¡Å¥ovna” in 1939 together with the building of “LidovÃ¡ univerzita Husova” (Theatre).